Climate change caused due to our careless activities towards our nature, ecosystem, and whole earth system. We are paying and will be paying in future for our irresponsible activities in past and present. Increased concentration of Green House Gases (GHG) has caused severe global warming which will cause melting of glacier and results in sea level rise. To avoid and reduce the intensity and severity of global warming and climate change, its mitigation is essential. 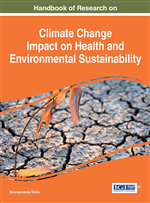 In this chapter we have focused on various issues related with climate change and mitigation strategies. Mitigation means an act which reduces the severity of a transgression and in climate mitigation context this term is used for reduction of anthropogenic activities which have spoiled the nature and as a consequence our climate. The Intergovernmental Panel on Climate Change (IPCC 2007) defines “climate change mitigation as technological change and substitution that reduce resource inputs and emissions per unit of output”. Although several social, economic and technological policies would produce an emission reduction, with respect to climate change, mitigation means implementing policies to reduce GHG emissions and enhance sinks. In other words mitigation is a preventive measure to reduce the GHG concentration and limiting the degree of future global warming. Mitigation is different from adaptation which defines the attempt to manage the unavoidable hit of climate change.